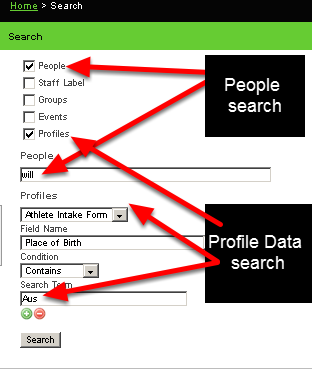 The Search module was created to enable a user to search for an athlete or a user with whom they are not familiar. 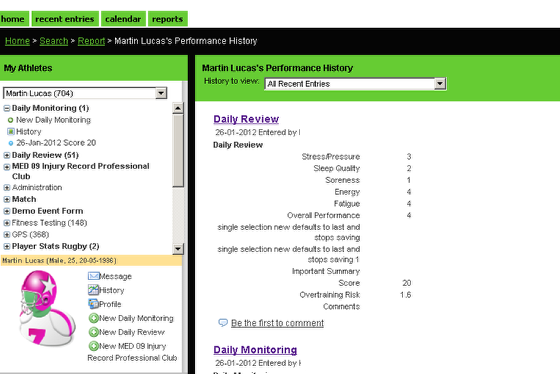 A Doctor may have met with a "Max" who was a "Cyclist" and in the Junior academy that is managed by a specific coach. The Doctor needs to find out more details about the athlete or enter in data for the athlete. Previously, to find out what group the athlete was he/she would have had to search through the groups, or know the athletes last name. Now a user can go straight to the "Search" module, add in "Max" to the people search, add in a group parameter for cycling, or even add in a staff label of who the athlete's manager is and all possible matches will appear. It is particularly useful in large system with a lot of athletes. 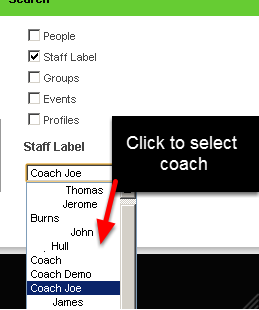 In smaller system, many of the coaches or staff will know the athletes details. Your administrator will consider whether this module should be enabled depending on the type of organisational set up that you have. The new Search Permission enables a coach or professional to search for users when they do not know many details about them. 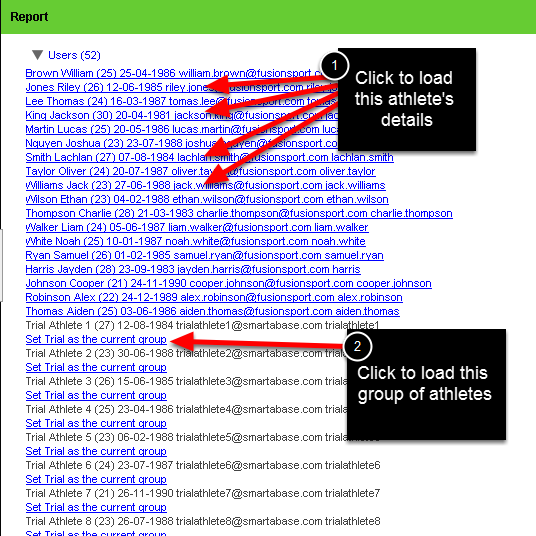 They can use details such as an e-mail address, first name or even search by group that they think an athlete is in to find the athlete in the system. 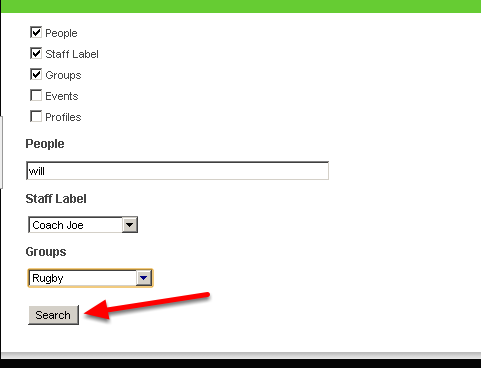 To enable the search module it is needs to be added to a users Role. You can create a new role or open an existing role and add it to the Role's Permissions List (shown in the step in the image below). 1.2 Type in "Search" into the Permissions text field and click on "Search Page" then click "Add Permission"
Add the Search Permission into the Role by typing "Search" into the text box and then clicking "Add permission". 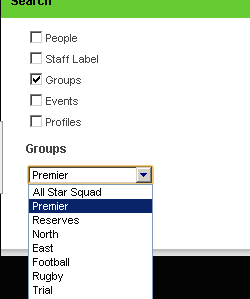 Alternatively, you can click add multiple permissions and only tick the Search Page in the Multiple Permissions List. 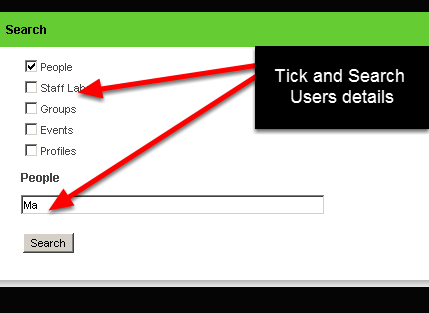 The image here shows that when you place a tick beside the type of information you want to search through, additional search options can be applied. These can be used separately, or combined to run a particular search all of the athletes on the system that you can access. The most important aspect of the search tool is that you MUST add in search parameters into the people, staff or groups search fields. 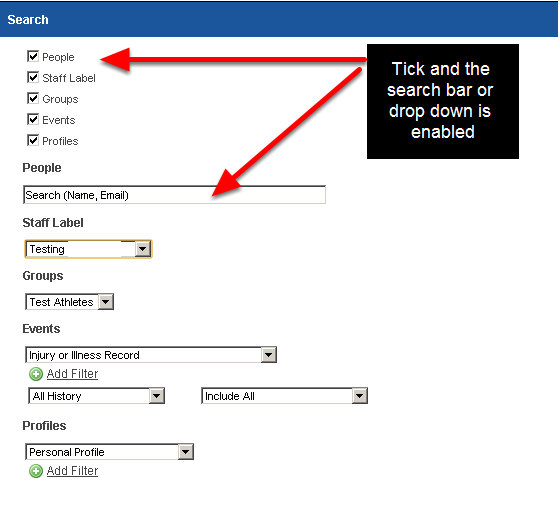 This search module was created to enable users to find an athlete or find an athlete's details when they do not have first and last name for an athlete or when they do not know which group of athletes they are in. 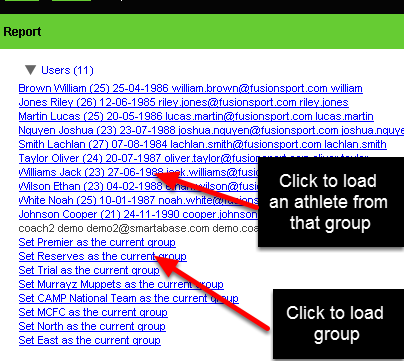 This Search tool is designed for typing in minimal details for searching and bring up the athletes details, or to load the group that the athlete is in. The Event and Profile searches are designed to be used IN CONJUNCTION with the people search parameters. When you tick on the "people" tick box a search box will appear for you to type in the details that you know about an athlete. It may be a first name, or just the first part of a name that you are not familiar with the spelling. For this example, we are using the partial search for any users with Ma in their first name, last name or e-mail address. This is not a case sensitive search. All results that match the search term (partial or full match) will be returned. The image here shows that "Ma" was included as part of an athlete's username as well as in their e-mail address. N.B You will only be shown the athletes that you have access to ensure data security. Coach Joe may have access to more groups and athletes, but if you do not have permission to view them, you will not be shown those results. 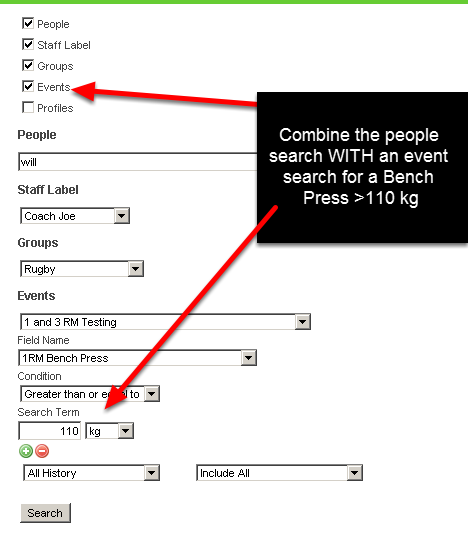 7.3 ALL of the athletes on the system will show under the "Users" link if NO Search parameters are added for the People section, and all of the events for 1RM bench will show under the "Events" link. 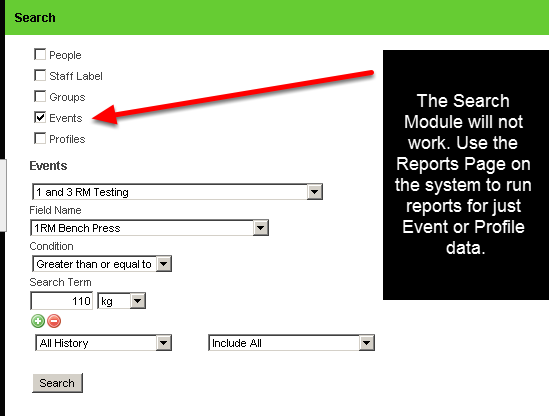 If you want to look at 1RM max values of a bench press >110 use the Reports Module. 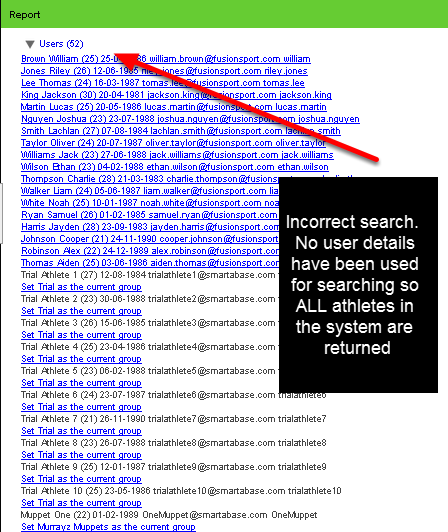 9.0 Remember that the Search Module is designed to search for athletes/ players on the system. Only use the Event and Profile Data parameters in conjunction with the People search parameters.